Matthews Wall Anchor has been providing structural solutions in the Pennsylvania area for new and existing commercial structures since the 1980s. These solutions include piling solutions, underpinning solutions, and shoring solutions. We use only the best products made for structural repair in the industry. These products are manufactured by Earth Contact Products, the leader in foundation repair products in the industry. We can repair anything from a settling foundation to floor slabs to a collapsing retaining wall. 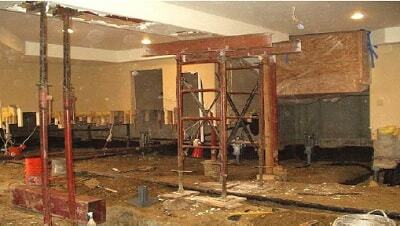 If it is a new deep foundation system you are in need of in Pennsylvania, we have the solution. We have the knowledge and products to provide the appropriate commercial foundation repair solution to satisfy your needs. Our structural engineers will make sure your project is planned and performed correctly. We take pride in the reputation we have established, and we intend to keep it that way. You can be assured you are getting an experienced team and will have the best products for your structural repair. Your structural repair will last for years to come. Let the professionals at Matthews Wall Anchor inspect your property and access your repair needs and give you a free estimate. Don’t let any of your structural repair needs be ignored. The longer the damage is there, the more it will cost you to repair in the future. We even offer commercial services such as snow removal and gas industry traffic control. Don’t hesitate, contact the experts at Matthews Wall Anchor today for any of your structural repair needs.